For a no sweat marketing campaign look no further than this custom logo Ridge Yoga Bag! This yoga bag is perfect for storing rolled-up yoga mats* inside and features two buckles to keep mat secure, a zippered compartment inside to store clothes or towel, an adjustable & removable carrying strap, easy carry handles with hook and loop closure, mesh pocket with drawstring closure for carrying water bottle* and two zippered pockets on front. 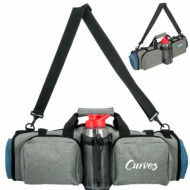 This is a great promotional item for yoga studios, dance studios, fitness centers, and other healthcare organizations. Order today! 1 Color Imprint on Front Pocket Included!